By now, almost everyone must have installed the very new Microsoft’s Windows 8 OS in their system. Of course, you must have installed popular browsers like Chrome, Firefox, or whichever you like the most. Well…let me tell you, the oldest name when it comes to browsers, Opera Browser, works simply awesome when downloaded to Windows 8. Opera Browser must have something very special enabled that lets it survive for so very long. I am a big Opera fan cause it browser does what it says. The Opera Browser claims to be the fastest Internet browser available over the web. It takes just a few seconds to start and load a website over Opera. The interface is very clear and have high-resolution content. One thing that makes me use Opera every now and then, even over my smart Android Phone, is the “speed dial” page that always come up whenever you open a new tab inside the Opera Browser. This helps you access your favorite web-pages using the displayed pre-configured “dial-pad”. Now, if it is not showing the one you use it very often, then the browser also provides an option to add your favorite webpage. Installing Opera Browser in Windows 8 is very easy. It’s very similar to how you install it in other OS such as Windows 7, Windows Vista, Windows XP, and the like. However, before I get down to its downloading process, let me quickly jot down the features of Opera Browser. 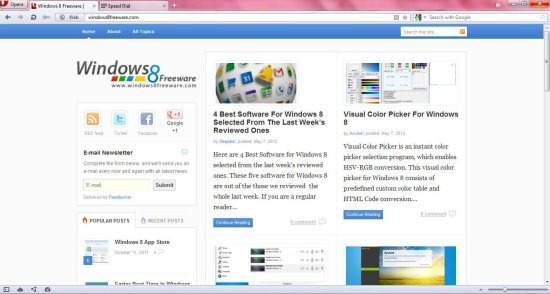 Also, check out our post on Firefox Browser in Windows 8. Yup…there you are. You can now start working over the Opera Browser in Windows 8. Go ahead and download opera in Windows 8 now…!